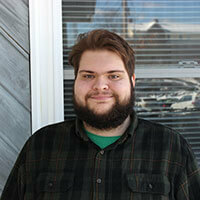 Maximillian Salunek’s heart wasn’t into college when he first came to SMCC. But after a stint away from school, he came back with new determination and is on track to graduate this spring. Max came to SMCC in 2015 after high school, but he struggled in class, was placed on academic suspension and left school altogether in the spring of 2017. He returned to SMCC with a new attitude that resulted in good grades, goals to shoot for, and a place on the Dean’s List this past fall. Max’s future goals have been influenced by his work on political campaigns in support of ballot initiatives for ranked-choice voting and an expansion of Medicaid benefits for Maine residents. He also worked on a candidate’s unsuccessful campaign in the Democratic primary for governor. More recently, Max organized a new student organization, Students 4 Democratic Socialism, to advocate for social justice issues. After he graduates in May, he plans to take a year off and then earn a degree from the University of Southern Maine. Ultimately, he hopes to be a political advocacy organizer or work with a nonprofit organization focused on health care or environmental issues. For now, he’s proud he turned around his grades and became a good student. 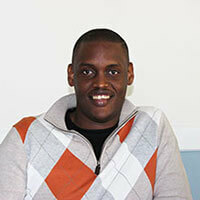 While growing up in Burundi, Adiel Nimbona loved to watch houses and highways being built. Now he’s earning a Construction Technology degree so he can build a future in the construction trade. Adiel moved to the U.S. in 2015 for opportunity and to escape the war and political strife in his homeland in central Africa. Drawn by SMCC’s location, construction program and low tuition, he arrived at SMCC in 2017 and later entered the inaugural class of SMCC’s Construction Institute, a workforce training program designed to give people skills in demand in the construction industry. After completing the institute, he decided to continue his education at SMCC in the Construction Technology program. He is now working toward a degree in Construction Technology and a certificate in Heavy Equipment Operations. Construction is Adiel’s passion, and he’s grateful he’ll have a bright future that probably wouldn’t have been possible in Burundi. Upon completion of his degree and certificate at the end of the next Fall Semester, he’ll have the skills to build houses and highways – something he’s dreamed about since he was young.